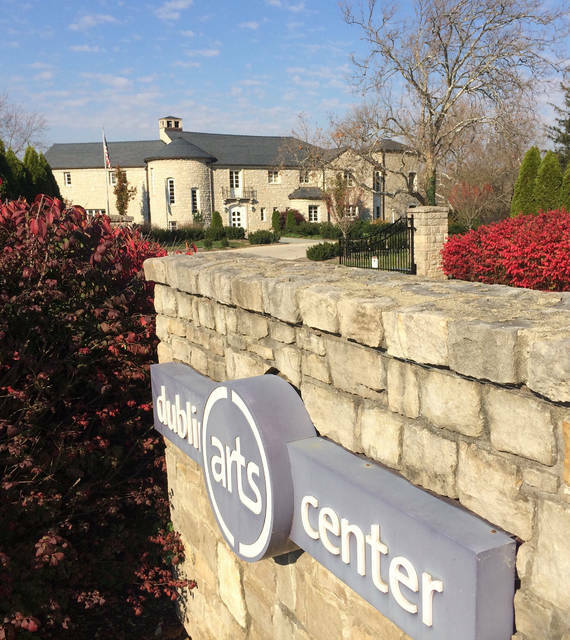 Monday, Sept. 10, 4 – 8 p.m.
DUBLIN, Ohio– (Aug. 13, 2018) Dublin Arts Council will host a free open house in the historic Dublin Arts Center, 7125 Riverside Dr., Dublin, Ohio, on Monday, Sept. 10 from 4 to 8 p.m. The event features guided and self-guided tours, an interactive photo collage project and more. The open house is being held as part of Ohio History Connections’ Ohio Open Doors initiative, created in 2016 to celebrate the 50th anniversary of the National Historic Preservation Act. During 10 days of Ohio Open Doors events, Ohio historic buildings and landmark sites are opened to encourage Ohioans to discover community heritage. The Dublin Arts Center is located in a historic home listed on the National Register of Historic Places. The stunning French Eclectic styled estate, built in 1941 by Charles and Sarah Krumm, features original art deco tile and fixtures, a circular stone stair tower and field stone wall cladding. The 4,800-square-foot home, sited on more than four acres of sloping riverfront grounds, is perhaps best known as home to the Gelpi family, the founders of Swan Cleaners who lived on the estate from 1947 to 1985, entertaining numerous political leaders and celebrities in their home over the years. Guests are encouraged to bring artifacts, such as photos, newspaper clippings and memorabilia to share in a community-curated exhibition. Storytelling activities will include creating written accounts and a video recording station. For more information about the Dublin Arts Center open house and to view the self-guided tour, visit www.dublinarts.org/dublinartscenter. Information about Ohio History Connections’ Ohio Open Doors events, which take place Sept. 7 through 16, 2018, can be found at www.ohiohistory.org. Dublin Arts Council (DAC) is a 501(c)(3) nonprofit organization, supported in part by the City of Dublin, Ohio, USA’s hotel/motel tax and the Ohio Arts Council, which helps fund Dublin Arts Council and its programs with state tax dollars to encourage economic growth, educational excellence and cultural enrichment for all Ohioans. DAC is further supported by the National Endowment for the Arts, contributions from individuals, corporations and foundations, fundraising events, classes, gallery sales and in-kind contributions. DAC engages the community, cultivates creativity and fosters life-long learning through the arts. TUSCALOOSA, AL (07/17/2018)— The University of Alabama awarded some 5,436 degrees during spring 2018 commencement May 4-6. With a beautiful campus, dozens of challenging academic programs, expert faculty and numerous opportunities for service and growth, The University of Alabama is a place where legends are made. UA offers its students a premier educational, cultural and social experience with more than 200 undergraduate, graduate and professional programs. The campus gives students the opportunity to interact with nationally renowned faculty performing cutting-edge research. FINDLAY, OH (07/19/2018)— Rachel Jones, of Powell, 43065, is an assistant trainer intern for J D Show Horses in Delaware, Ohio, for summer 2018. Jones is pursuing a degree in equestrian studies. Located in Findlay, Ohio, the University of Findlay is known not only for science, health professions, animal science and equestrian studies programs, but also for cultivating the next generation of business leaders, educators and innovative thinkers through a dedication to experiential learning, both in and outside of the classroom. Established in 1882 through a joint partnership between the Churches of God, General Counsel and the City of Findlay, the University of Findlay has nearly 60 majors leading to baccalaureate degrees and offers 11 master’s degrees, and four doctoral degrees. More than 3,800 students are enrolled at Findlay, and the University is nationally recognized by U.S. News and World Report and the Princeton Review. UNIVERSITY HEIGHTS, OH (07/19/2018)— Miranda Noday, a Marketing major in John Carroll University’s Boler College of Business, has a summer internship with Foresters Financial, Inc. Both undergraduate and graduate programs at Boler combine classroom learning with significant project work and exposure to business leaders and challenges. Noday will graduate from John Carroll in 2020. Alexis Elder does not work for, consult, own shares in or receive funding from any company or organization that would benefit from this article, and has disclosed no relevant affiliations beyond their academic appointment. Good friendships seem worth celebrating. But for many of us, tensions can appear from time to time between being a good friend and doing “the right thing.” When faced with, for example, a situation where it’s tempting to lie to cover for a friend, it can seem as though friendship and morality are on a collision course. I am an ethicist who works on issues involving friendship, so this tension is of great interest to me. It can be tempting to say that bad people are likely to treat their friends badly: For example, they could lie, cheat or steal from their friends. But it seems logically possible for a person to be bad to some people but good to others. So are there other, more fundamental reasons to think being a good person is necessary for a good friendship? Let’s begin by looking at cases where morality and the demands of friendship are in conflict. Friendship seems to require that we be open to our friends’ ways of seeing things, even when they differ from our own. It also seems to require that we be concerned for our friends’ well-being. It’s not just that we desire good things for them. We also want to be involved ourselves in providing at least some of those goods. This is one thing that distinguishes the care of friends from that of mere well-wishers. But we also need to remain open to our friends’ beliefs about what is good for them: Blithely acting on what we think is best for our friends, when the friend disagrees, seems paternalistic. In some circumstances, like hiding a friend’s keys when he’s been drinking, a little paternalism might be permitted. But it seems a poor general feature of friendship. Some theorists argue that it is this openness to friends’ perspectives that introduces moral danger. For example, friendship with a person who has different values can gradually change your own, including for the worse. This is especially true when the relationship makes you inclined to take their point of view seriously. In other words, if your friend asks you to tell the boss she’s sick, not hung over, you should do it, just because she asked. In order to respond to these concerns, it is helpful to review what Aristotle says about friendship and being a good person. For Aristotle, there are three main kinds of friendships. One, friendships of utility: as, for example, between friendly co-workers. Two, friendships of pleasure: for example, between members of a trivia team. And, three, friendships among those who find each other good and valuable for their own sakes. This last one he calls friendships of virtue, the best and fullest form of friendship. It seems reasonably clear then why valuing someone for their virtues is characteristic of good friendship. Unlike the other forms of friendship, it involves valuing friends for themselves, not just for what they can do for you. Furthermore, it involves thinking their character and values have worth. Some might worry that this sets the standard too high: Requiring that good friends be perfectly good would make good friendship impossibly rare. But Aristotelian scholar John Cooper argues that we can just take this to mean that the quality of a friendship varies with the quality of the friends’ characters. Mediocre people will tend to have mediocre friendships, while better people will have better friendships, all else being equal. This might all seem hopelessly subjective, if we leave “good person” undefined, or think it is relative to a person’s individual values. But Aristotle also offers an objective account of what it takes to be a good person. A good person, he says, is someone who possesses the virtues. Virtues, like courage, justice and moderation, are individual qualities of character that help us live good human lives, alone and together. Aristotle argues that just as sharpness is a quality that helps a good knife perform its function well, we function better as human beings when we can protect what we value, work well with others and enjoy pleasures in moderation. He defines bad qualities, or vices, as those qualities that make it harder to live a good life. For example, cowards have trouble protecting what matters, gluttons don’t know when to stop consuming and unjust people exhibit what he calls “graspingness,” grabbing for more than their share. So, they have trouble working well with others, which can be a major impediment for a social species. Lastly, and crucially, he says that we build up these qualities, both good and bad, through repeated practice: We become good by repeatedly doing good, and bad by the reverse. How then can this help us understand the relationship between being a good person and being a good friend? I have already said that friendship involves both openness to friends’ perspectives and helping them out. Assuming Aristotle is right about the relationship between good character and ability to live well, it is not good to enable a friend who acts badly, because doing so will make it harder for that friend to live a good life. But friendship is also not served by riding roughshod over the friend’s own beliefs about what he or she needs, even if those beliefs are mistaken. So the only people we can consistently do well by as friends are those who have reasonably good character. We can, of course, change our own values and reactions to better match our friends. Much of this can happen unconsciously, and some such change might even be healthy. But when this change is for the worse (for example, becoming cowardly or unjust), we seem to be harmed by the association. If time spent with my lazy friend tends to make me less motivated when it comes to my own life, I arguably am worse off. This can make such friends bad to us, even if unintentionally. Really good friendship, it turns out, isn’t even possible unless both friends are reasonably good. The apparent tension between friendship and morality turns out to be just an illusion that results from failing to think carefully and clearly about the relationship between openness to our friends’ perspectives and our interest in helping our friends. Lisa F. Carver does not work for, consult, own shares in or receive funding from any company or organization that would benefit from this article, and has disclosed no relevant affiliations beyond their academic appointment. In this watched world, our data is compiled into products to be used by businesses, not only to discover what we buy, but to understand how we are doing financially. I predict the next step in our watched world is the creation of a “wellness report” for each person. Like a credit report, a wellness report could collect all those little pieces of health-related data to paint a picture of our health or document possible illnesses. Wearable technology, smart watches and smartphones are already collecting our health data. They track your distance, speed and heart rate, and some can even note if your heartbeat was irregular. But what if they went further, combining those little bits of data from wearable devices with medical appointments or food logs, stored in apps on your phone, plus the health products you buy and the prescriptions you fill, all recorded on your points card? Many apps are already gathering information that is unrelated to their primary consumer use. For example, of the more than 300 apps studied by the Yale Privacy lab, 75 per cent host third-party trackers collecting data on our activities. Taken together, a description of your health and behaviour begins to emerge. Those who are very fit or healthy might see this as a good thing. However, technical glitches do occur and, when it comes to health, there is a wide range of “normal.” So, even if you are healthy, you could be at risk. Health data could be used like credit data to group users based on their behaviour and risks and create categories of wellness that influence your choices going forward. With credit scores, our future credit-worthiness is extrapolated from our current borrowing behaviour. Credit scores control access to homes, vehicles and other consumer items. They help some people, generally those with steady jobs, and hold back others, including those who work part-time or are underemployed and can’t always make payments on time. The same might be true for a wellness report, with future illness probability derived from symptoms detected by your apps and wearable tech. Banks, businesses and credit lenders provide financial support to credit-reporting companies. In return, they receive data that indicates their risk when they loan money. People with low credit scores are considered higher risk, and as a result, they have more difficulty getting loans or face a higher cost of borrowing — generally in the form of higher interest rates. A wellness report could be a resource for private insurers, medicare and health-care providers to gauge the risk associated with providing a service. For example, a hypothetical wellness score — based on data collected and aggregated in novel ways — could determine how much you might pay for travel and health insurance — if you receive it at all. In this hypothetical future, your travel insurance premiums might go up if your smart watch records heartbeat irregularities, especially if this is combined with data from an app that takes note of your appointment for a heart-screening test, or a points card that records your Aspirin purchase. It’s also possible that your health data could negatively affect your eligibility for certain health and medical procedures. For example, a procedure might be denied if your wellness report indicated that you might have an undiagnosed illness that could lead to complications. Credit reports are built and maintained without permission or notifying the reportees. They are notoriously difficult to monitor and correct. A wellness report, if developed, would face the same complications. Errors might take days or months to correct, and might require experts or medical tests to disprove. Like credit reports, errors in data reporting could harm those with flawed reports. The harms to the individual will be far greater than the costs to insurers. For example, what if you were drinking coffee like it was water to stay ahead of a deadline, and the data from your wearable device and phone apps merged to show that you had high blood pressure or a slightly elevated heart rate? If this data were compiled into a wellness report, you might find travel insurance more expensive — or skydiving school out of the question. Older adults are especially vulnerable to the negative impacts of health surveillance. Illness and disease become more common as we age, and the early warning signs may be detectable long before the disease impacts our lifestyle or behaviour. When it comes to health or travel insurance, older adults, many of whom who have fixed incomes, may be faced with higher premiums they just can’t handle. And what if credit and wellness report data was combined? Where would that leave the vulnerable? Although countries offer advice and safeguards to protect consumers, the only way prevent this kind of data collection and compilation is through legislation. We need to talk about these privacy concerns now, and insist on government protection, before private insurers and health providers invest in novel applications of already existing data to create and use wellness reports to protect them from risks — not us.